Previously taken advantage of a runners world subscription, whereby got free wireless earphones. That was a couple years ago now (found on here). 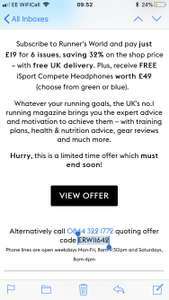 Came into an email tonight offering same deal, 6 months subscription for £19, but with free wired earphones rrp £49.99. Decent deal, even if cancel the subscription after the 6 months. Bought a pair of these headphones on September from Amazon warehouse for £15 and they are really good IMO. They are wired obviously. Looks like the newer version of mine is included, heat added. Are you sure they are wireless headphones ? The ones on this deal are wired, not wireless OP, need to change your title. Deal posting newbie! This is NeilDooher first deal post. Help out by leaving a posting tip or just to show your appreciation for their contribution.